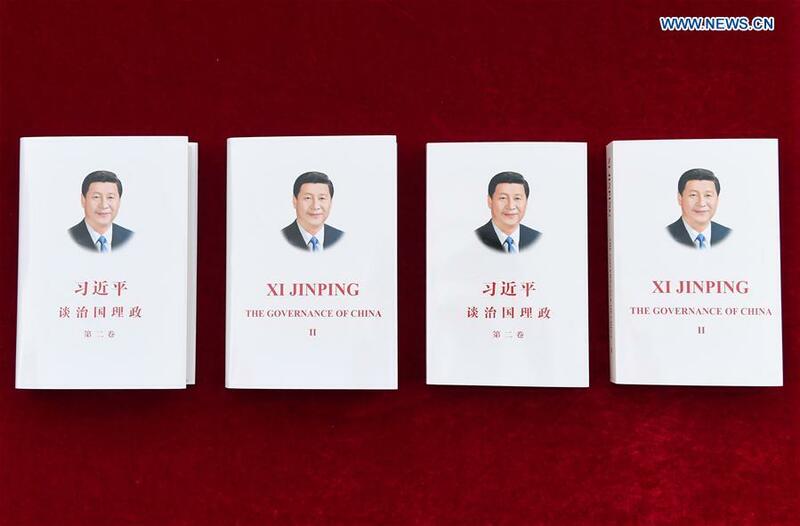 BEIJING, Nov. 7 (Xinhua) -- The second volume of Chinese President Xi Jinping's book on governance has been published in both Chinese and English, the publisher said Tuesday. The second volume of "Xi Jinping: The Governance of China" collects 99 of Xi's speeches, conversations, instructions and letters, as well as 29 photos of the Chinese leader, between Aug. 18, 2014 and Sept. 29, 2017, the Foreign Languages Press said in a statement. The articles are divided into 17 topics and the book also adds some necessary annotations to improve readers' understanding, according to the statement. Over the three years since the publishing of the first volume in September, 2014, Xi, also general secretary of the Communist Party of China (CPC) Central Committee, has continued to put forward a series of new concepts, thoughts and strategies, enriching the CPC's theories, it said. The second volume depicts the practices of the CPC Central Committee, with Xi at the core, in uniting and leading Chinese people to uphold and develop socialism with Chinese characteristics in a new era, the statement said. It reflects the development and main contents of Xi Jinping Thought on Socialism with Chinese Characteristics for a New Era. The newly-published volume is also expected to help the international community better understand the path, concept and model of China's development, it added. An amendment to the CPC Constitution, approved at the Party's 19th national congress last month, has made Xi Jinping Thought on Socialism with Chinese Characteristics for a New Era a new component of the Party's guide for action. As of August, the first volume of "Xi Jinping: The Governance of China" had sold 6.42 million copies in 21 languages in more than 160 countries and regions. U.S. ambassador says upcoming Xi-Trump meeting "historic"